RVing and four-legged friends definitely go hand-in-hand. 76% of RV owners also own pets – and, of those owners, 53% have dogs and 41% have cats. Those are numbers we can stand behind! If you’re up-to-speed on the travelling tips for your furry friends, we can move on to the fun stuff! 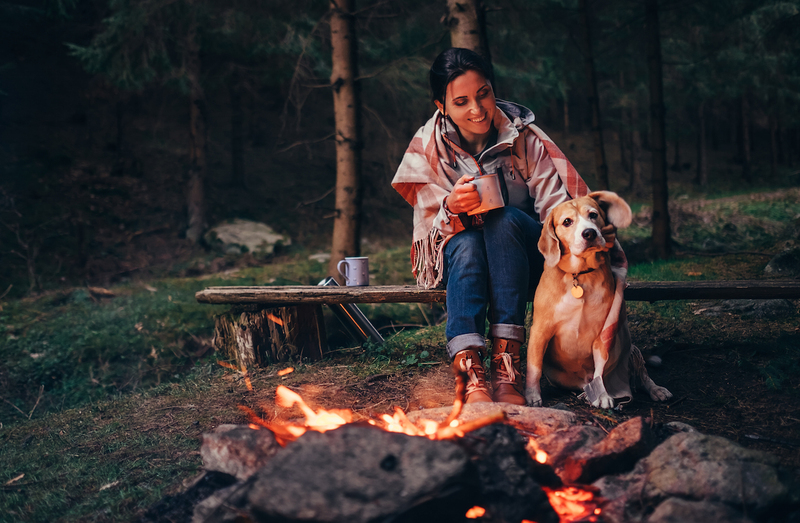 With so many fur-babies living and loving life on the road, this list of must-pack items for your next RV trek with your pup will come in handy. You’ll want an airtight pet food container in your RV for a few reasons. First, jumbo bags of food aren’t easily stored in tight spaces. Second, open bags could attract unwanted critters or tempt your pups to get into trouble if not kept out of their reach! And, of course, everything needs to be stored and sealed securely before you pull out of the driveway. A lightweight, collapsible bowl is perfect for outdoor lifestyles. These rubber bowls are easy to pack in your pup’s adventure backpack for days outside exploring and they won’t scoot across the floor of your RV like metal or plastic bowl might. Let your dog carry his own toys, treats and water in an adventure puppy backpack. Your back will thank you – and, if he’s a hiking dog, he won’t mind! They come in all sizes, so you can choose the style that best fits your pup without weighing him down too much. Plus, everyone knows a tired dog at the end of the day is a good dog – two benefits in one! Keep muddy paws off your car seats with a waterproof dog seat cover. Some are hammock style for bench seats, while others cover the trunk of an SUV, so your pup stays safe in the back. Another vehicle accessory that doubles to keep your pup safe is a seat belt harness that clips onto your regular seat belts. Otherwise, some dog owners like to use a travel kennel to keep everyone in their spots while driving. It’s hard enough to keep the house clean with a dog running around, let alone the RV while camping in the wilderness. Mud stays outside of your RV with a specialty outdoor dog-grooming tool. This hose and brush combo plugs into your outdoor taps to deep clean their fur. Not all dogs like to swim—shocking, we know! Some pups are a little wary of the water, so keep them safe when you’re playing by the lake with their own doggy float coat. There are plenty of options to choose from, but they are all essentially a four-legged life jacket for pets. Aside from these fun extras, make sure you always have your pet’s important basics with you like their leash, collar and tags, supplements and medications, and also their health documents in case of emergency. However, there are a few more things to pack if you’re travelling to the US with your pets. Now, all that’s left is to decide where to go! Luckily there are lots of pet-friendly RV campgrounds in Canada. Go RVing Canada will be making trip planning even easier in 2019 with new website updates and a revamped tool. Stay tuned for a big announcement in Spring 2019! Where will you take your pets this RV season? Show us your furry camping squad on < a href="https://www.facebook.com/Go-RVing-Canada-156852814413471" target="_blank">Facebook, Twitter, Instagram and Pinterest.